For a nation to truly prosper, its citizens must have good Health. Those who enjoy good physical and mental health report high levels of wellbeing; and an effective health infrastructure is critical for sustaining per capita income. Poor health keeps people from fulfilling their potential. Having risen strongly at the beginning of the last decade, world Health is now beginning to decline. Aspects of Health causing the score to fall this year were worsening emotional wellbeing (increasing reports of sadness and worry) and people perceiving more frequent health problems. Latin America and the Caribbean was the only region to exhibit a meaningful rise in its Health score, as it improved vaccination rates. Its citizens are also reporting the highest level of joy since 2010. Health Outcomes are the basic outcomes expected by members of a prosperous society. This includes mental and emotional wellbeing, as well as basic measures of mortality and life expectancy. Saudi Arabia saw the largest improvement in the last year. As well as citizens perceiving themselves to have fewer health problems, they are also feeling happier and experiencing less sadness and worry. Sub-Saharan Africa has declined in this sub-pillar more than any other region in the last five years. While life expectancy has increased since 2012, people are experiencing much more sadness and worry, and reporting increased struggles with health problems. Health Systems Quality looks at the adequacy of health infrastructure, service quality and preventative care (including sanitation, immunisation and broader public health). This is reflected in people’s satisfaction with their healthcare. 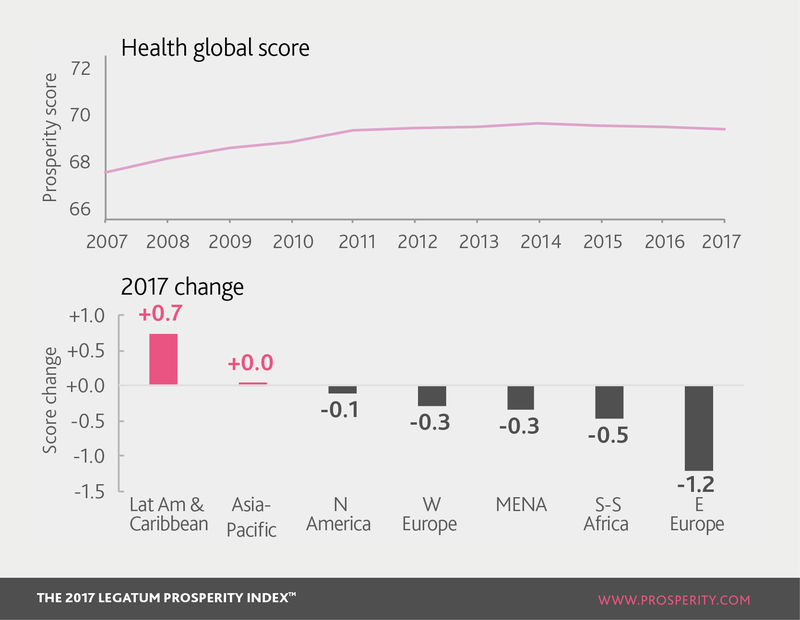 Latin America and the Caribbean saw a large increase in Health Systems Quality in 2017. Guatemala saw the largest global increase in vaccinations against measles this year. Ethiopia has greatly increased its coverage for measles and diphtheria vaccinations in the last five years, giving its health score a boost. Ukraine, by contrast, has witnessed a sharp drop since 2012 in its vaccination coverage. Ukrainians are also among the least satisfied in the world with their healthcare. Illness and Risk Factors measures the extent to which the health system’s coverage and performance are effective at maintaining the health of the population. Japan is the best performer in this sub-pillar thanks to its having the fourth-lowest rate of obesity in the world. The world’s five most obese nations are all in the Gulf – Qatar is the worst, in spite of ranking first in the world for the quality of its health systems.